Once you've accumulated SCENEPOINTS you can use them in exchange for benefits such as reduced entrance fees or free beverages. There are several levels of SCENEPOINTS memberships. Once you've accumulated 10.000 points or more, you are eligible for the SILVER, 50.000 points for the GOLD and 100.000 for the platinum membership. 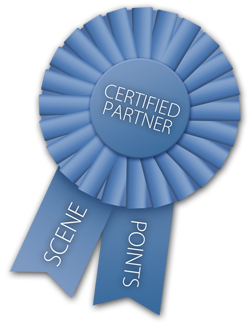 How do I know a Demoparty is a certified SCENEPOINTS partner? That's easy. Just look for the button displayed here. Only Demoparties with this logo are official authorized SCENEPOINTS partners. That's also very easy. Just ask one of the organizers of a SCENEPOINTS certified Demoparty. They have applications and brochures that will tell you everything there is to know! IT'S LIKE THE FUTURE, BUT NOW!